Reflection Nebula M78 as photographed by Evered Kreimer. This is a 15-minute exposure by Evered Kreimer on October 22, 1966, from Prescott, Arizona with his cooled camera and self-made 12.5-inch Newtonian Cave reflector. This image acquired some late fame in February 2004, when J.W. McNeil's supposedly "newly" discovered nebula was discovered in it by a considerable number of attentive readers of these webpages. 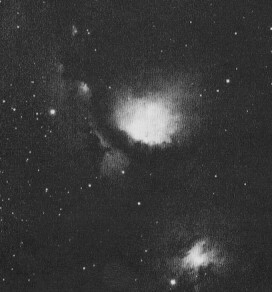 McNeil's Nebula is clearly seen in the upper left of this image; it is about 1/4 from left and close to the upper edge, left of a notable double star, and above NGC 2064, the nebula above and left of M78.